Over 290,000 boxes of Chilean cherries, blueberries, apricots, peaches, nectarines, and grapes delivered to Wilmington. Wilmington is a major port of entry and distribution center for the seasonal importation of fresh Chilean winter fruit. During this season, Wilmington anticipates receiving at least 25 shiploads of Chilean fruit. 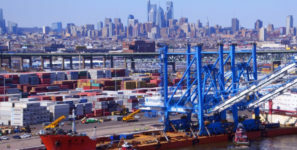 The Port of Wilmington, Delaware, received the first breakbulk shipment of Chilean winter fruit to arrive in the US for the eighth consecutive season. The m/v Green Italia, a specialized refrigerated vessel operated by Trans Global Shipping NV in the Global Reefers service, was welcomed on Monday, December 18 to Wilmington’s perishable cargo marine terminal. The Green Italia commenced discharging her cargo of over 290,000 boxes of fresh cherries, blueberries, apricots, peaches, nectarines, and table grapes on December 18. During this season, the port anticipates receiving at least 25 shiploads of fruit from the Chilean ports of Valparaiso, Coquimbo, and Caldera. Global Reefers is the sole shipping line providing an express service direct from Chile to the Port of Wilmington. The carrier was formed in 2013 through the combination of Seatrade, the world largest specialized refrigerated ship owner and operator, and Pacific Seaways, Chile’s most important shipping group created and managed by fruit growers and exporters. The arrival of the Green Italia marks the eighth year in a row that Delaware’s Port welcomed the inaugural breakbulk shipment for the Chilean winter fruit season. “We are privileged, to once again serve our customers and trade partners in support of the timely distribution of the freshest available fruit to North American consumers,” said Gene Bailey, the port’s Executive Director. The cargo is stored in the port’s 800,000 square-foot on-dock refrigerated warehouse complex, one of North America’s largest, before distribution throughout Canada and the eastern US. The port handled over 14.1 million boxes of Chilean fruit in the 2016-17 season. This trade supports over 857 jobs and annually generates $48 million in personal income, $51 million in business revenue, and $5 million in tax revenue for the State of Delaware and the region.